Cinder is part of new population in New Beijing, home to androids and humans. She's part human part cyborg, and detested for that. When Prince Kai comes to find her, in need of a mechanic, she quickly finds herself drawn to him and his life. But Cinder doesn't realise that there's more to her identity than she was told. She soon finds herself choosing between duty to the country or her own desire for freedom. Even if it means losing everything she has, including her life. I wonder why I always find the well-loved series to be the ones I think was okay, not the absolute best. I was excited to read Cinder, and my brother really enjoyed it as well, so I think I expected quite a bit. It wasn't a bad read, it just didn't wow me. I liked that it was an interesting take to the original tale. 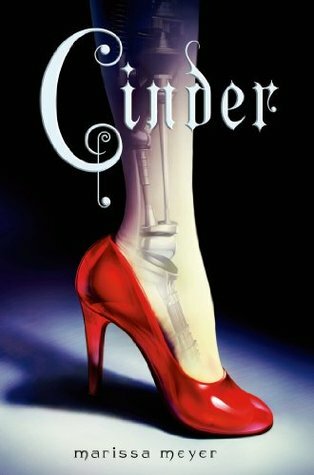 It still retained all the Cinderella aspects, but Meyer revamped the story so it stood out on its own. It was definitely different to the usual re-tellings, and a part of that was because of the world. The world building was strong, and the history behind the setting was what made it believable. I don't think World War IV is upon us, but I think it's a possibility. Something also intriguing was how New Beijing is a futuristic city, with modern technology and cyborgs but it reverted to monarchy - a system that is now long gone for China. I guess Meyer added the element to support the story about Cinderella, but I did find it ironic. I don't think I entirely liked the characters. They seemed a bit flat to me, existing only in the book without dimensions to make them seem alive. I think that's why I couldn't attach myself to any of them. Cinder is smart and down to earth, but she was another version of the typical candy girl. Kai was the equally typical Prince Charming - cute, funny and loved by all. No one else really struck out at me either. Except maybe Dr. Erland, only because he was a mysterious character that I got to slowly learn about. I would have to say the relationship development was very insta-love, but I just took it as it is because that's basically what happened in the fairytale as well. The plot twist was predictable right from the start, which made me impatient to get to the end. I just wanted to reach the moment where Kai and Cinder had their confrontation but it dragged out. What makes me want to keep reading the series though, was the cliffhanger in the end and what I would think is the transformation in Cinder. It's a driving point that I think could hold a lot of potential.